Registration is open until Friday, March 8. Contact your local Salvation Army to register. Excitement is already in the air about the 2019 Florida Women’s Retreat, where women will gather together to encounter God, deepen relationships, be challenged, be inspired from the Word of God, and leave changed! 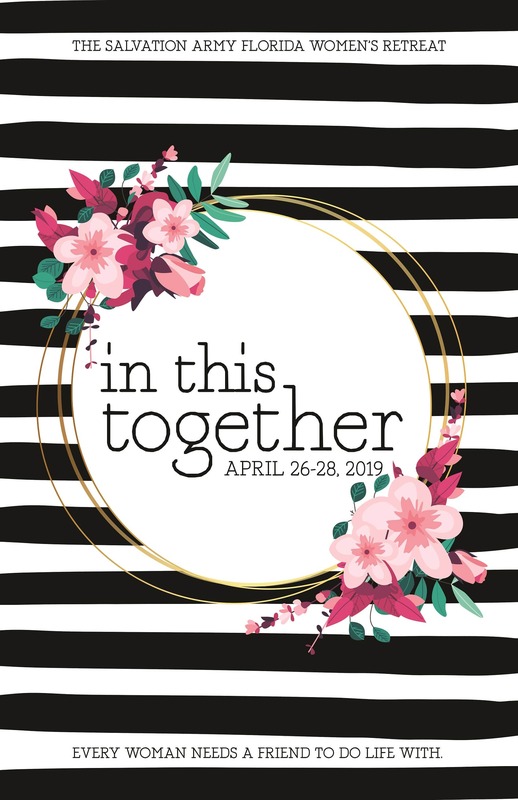 Our theme is In This Together, emphasizing the value of women connecting and investing in one another, and the importance of being vulnerable and transparent in the process. WE BELIEVE EVERY WOMAN NEEDS A FRIEND TO DO LIFE WITH! Women were created to be relational – we need each other. We need spiritual friendships that will nourish our souls. It is ironic that, in our age of social media connections, many are feeling lonely and disconnected. God calls us into community and wants us to invest in one another. So, let’s invite everyone to the party! Let’s invite our women we connect with in ministry settings – Bible studies, Home League, prayer and discipleship groups, social services, employees and volunteers! What if everyone brought a new girlfriend, neighbor, sister or daughter? We look forward to sharing this experience with each one of you!